How Do I Take the Right Compass Reading? There are many basic questions about how to read a compass for feng shui: Should you take a reading at the front door and the back door? Should the door be closed or open? Do you need magnetic north or geographic north? Can you use a regular compass? All of these are good (and common) questions, and the answers will help you take an accurate compass reading of your front door, which gives you the feng shui direction of your house. You can use the home's direction when creating a feng shui diagram and as a guide for decorating the front door and many other feng shui improvements. Front Door or Back Door? For feng shui purposes, you need only the compass reading of your front door, not your back door. The front door is the where the energy nourishment, or Chi, enters the home. The back door is a consideration when placing feng shui cures or furniture inside the home, but this is not related to the door's compass direction. When measuring compass direction, use the original front door, or main entry, of the home. Do not use a secondary entry, such as a side door or garage service door, even if that's the door you go in and out of most often. To get the most accurate feng shui compass direction, you need to take several readings. This is because your compass readings may vary due to the interference of electromagnetic fields. If there is a strong presence of iron or steel objects close to you, such as in the main door hardware, or if you are wearing a metal watch, belt, or jewelry, this can distort the compass reading. Therefore, it is best to remove your watch, belt, and jewelry and to move away from the front door to ensure more accurate results. To help compensate for unavoidable discrepancies in compass readings, it's also best to take readings in a few different locations, then calculate an average of the compass directions. Take the first reading while inside the home looking out, facing directly through the front door. Take another reading while standing inside the door, again facing straight out, as though your body is the front door. Take a few more readings from inside and outside the house, always facing the same direction as the front door. Calculate the average reading by adding up all of the readings then dividing by the total number of readings. For example, if you took five readings (32 degrees, 35 degrees, 37 degrees, 32 degrees, and 34 degrees), the average would be: 32 + 35 + 37 + 32 + 34 = 170; 170 divided by 5 = 34 degrees. Magnetic North or Geographic North? Compasses respond to the north-south magnetic field of Earth, and a compass reading indicates magnetic north. Geographic north (also called true north), essentially is the location of the North Pole, found on maps and globes. The difference between magnetic north and geographic north depends on where you live. But there's an easy rule to follow: For feng shui purposes, you need to know only the magnetic north, or compass reading, of your front door. There is no need to adjust your reading for the geographic north. Which Type of Compass to Use? For a basic reading of your front door's compass direction, it is perfectly fine to use a standard compass that gives you a degree number from 0 to 359. Another type of compass used for feng shui is a Lo-Pan, an ancient Chinese tool used to identify the bagua of a home as well as deeper feng shui information. Lo-Pan compasses typically are used only by experienced feng shui practitioners and masters, who have the experience to fully understand its readings. 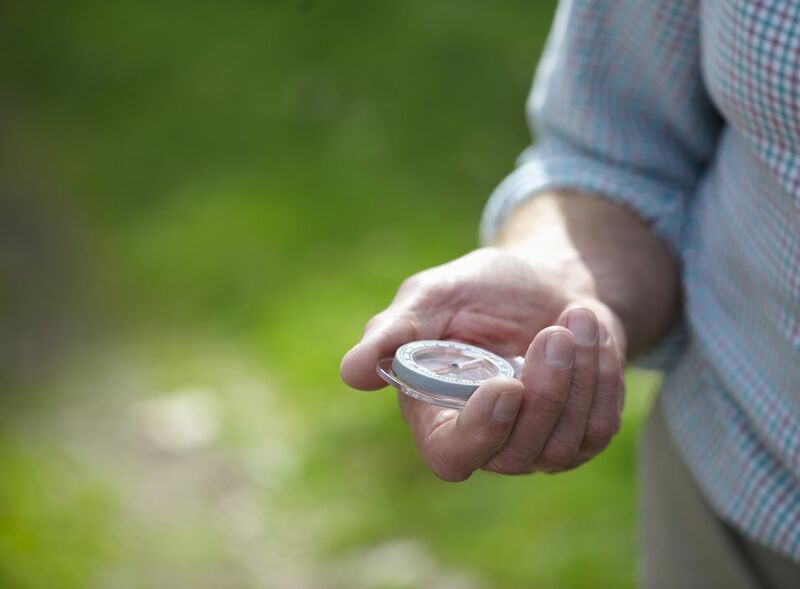 You can use a traditional magnetic compass to find your front door's direction, or you can use the compass app on a smartphone. For an accurate reading, hold the compass or phone directly in front of the center of your body, keeping your back parallel to the front door. With a traditional compass, usually you rotate the dial to match the needle's position, and the numbers on the dial indicate the compass direction. With a smartphone compass, you simply read the number on your phone's screen. Note that some smartphones can be set to read geographic north (true north), so check your settings to make sure this option is turned off. What is A Feng Shui House Sitting Direction?